Curly hair can be hard to work with and finding cute hairstyles for curly hair that you can do on your own can be a little difficult as well. I had originally intended to cover all curly hair lengths in this article but decided it would be better instead to split the subject up into three categories: cute hairstyles for long curly hair, cute hairstyles for medium length curly hair and cute hairstyles for short curly hair. That way you can get the information you need without having to wade through a bunch of information that is no use to you. Before we get to the hairstyles though, I want to take a moment to talk about “blowing hair under” since you’ll need to do this for two out of the three styles I’m going to walk you through here and it is a bit complicated so I thought it was worth talking about a bit more in depth. To blow hair under, you’ll be using a brush and a blow dryer to, basically, blow your hair under. Pretty simple. Start by separating the section of hair you need to blow under. Position your brush under the section of hair at the root and hold the dryer directly above the brush. The section of hair should be between the brush and the dryer. Pull the brush toward the end of your hair, keeping the hair taut and keeping the dryer moving over the hair at the same time as the brush is moving through it. When you get to the middle of the length of the hair, begin turning the brush so the ends are curling under the rest of the length of the hair. Make sure you keep the hair taut and the dryer moving with the brush. You’ve known blown the hair under. Beyoncé has worn a whole lot of styles I love but this is one of my absolute favorites. The great thing about this style is that it tones down the volume a bit leaving your with a sleek look that is fun, flirty but still sophisticated enough for more formal events. It also adds shape to the face. While this one works best with diamond, oblong, oval and square face shapes it can easily be altered to suit any face shape. It’ll take about twenty minutes to get this look. Step One: Start by moisturizing your hair. Moisturizer is important for this style because you will be using a lot of heat and moisturizer will help protect your hair from damage from the heat. Apply your moisturizer by putting a dab of it in your palm and working it through your hair from the middle lengths to the tips. Step Two: Once your hair is moisturized, add your sculpting lotion. While I prefer mousse over sculpting lotion in general, for a look like the one Beyoncé is rocking here, nothing beats sculpting lotion. Apply your sculpting lotion the same way you applied your moisturizer in step one except this time, don’t ignore the roots. Start at the roots and work the lotion through to the tip. Step Three: Part your hair down the middle using your comb. Use the end of your comb and take your time so you can get a straight, even part. Step Four: Comb your hair out and separate it into four equal sections. Twist each section and secure it with the hair claws. When you’re done, you should have two sections of hair secured at the front of your head (one section on the right and one section on the left) and two sections at the back of your head (one section on the right and one section on the left). Step Five: Release one of the sections from the back from the clip and blow it under using the method we talked about at the beginning of this article. When you’re done and the hair is dry, release the second section from the back and blow that section under. Step Six: Release the first section at the front of your head and blow it under the same way you blew the back under in step five except this time, pull the hair forward toward your face. This gives your hair a little extra body. When you’re done, blow the final section of hair under, once again pulling the hair forward toward your face. Step Seven: Roll the back section of your hair in your medium hot rollers. To do this, you’re going to start at the crown of your head, separating a small section of hair that is no wider than the roller itself. Comb out this section of hair to make sure it’s completely tangle free and then wrap it around the curler, starting at the tips and roll it under until the roller meets the scalp. Secure the roller in place and move on to the next section, working down section by section until you reach the nape of your neck. Step Eight: With the back in rollers, it’s time to move on to the sides. You’re going to do the sides the exact same way you did the back, starting at the crown and working down section by section. When you’re done, all of your hair should be in rollers. Step Nine: Allow the rollers to cool entirely and then remove them. Step Ten: We’re going to add a little volume now by gently teasing the hair. Start with a small section from the middle area of your hair. The section should be no bigger than the length of the toothed area on your comb. Hold the section straight up and position your comb at the roots of the hair. Move the comb up and down along the shaft of the hair. You’re done when the section of the hair can stand on its own. Repeat this section by section until you reach the crown. Step Eleven: Put a small amount of styling wax on your fingertips and pinch the ends of your hair. Step Twelve: Add a little more wax to your fingertips and apply it to the roots of your hair, rubbing it into the roots while lifting the strands to give your hair a little boost and beautiful, soft volume. Step Thirteen: Apply a very small amount of shine serum to the palm of your hand and work it evenly through your hair, starting at the middle lengths of your hair and working it through to the ends. Three quick things to remember about using shine serum. Avoid adding shine serum to your roots. Make sure you apply it evenly throughout your hair. Avoid using too much of it. Shine serum is a great tool but it’s also a tool that can easily be misused. Shine serum on your roots can make your hair look heavy or oily and that’s obviously something you want to avoid. Applying too much can have the same effect. Spread it evenly through the middle to ends of your hair though and it you should be fine. Step Fourteen: Finish up your look by adding hairspray. You just need a light misting to keep your hair in place and to tame fly aways so don’t go overboard. A little spritz or two will do the trick. In my always humble opinion, Dianna Agron is one of the most stylish, most beautiful young actresses working in the entertainment industry today. 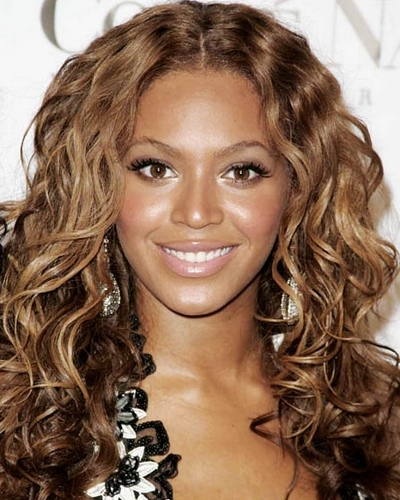 She’s a total trendsetter and this gorgeous casual curly hairstyle is a great example of why that is. The woman just knows what works for her and this look definitely does. The good news is that this look can work for you too. It only takes about half an hour and requires little in the way of product or know-how. It suits diamond, oblong, oval and square face shapes best as is but can easily be altered to fit other face shapes as well. Step One: Wash your hair and dry it until it is damp – not completely dry but not completely wet either. Step Two: Put a dab of mousse in the palm of your hair and work it through your hair, avoiding the roots of the hair and focusing on the shaft. If you apply mousse to the roots of your hair it’s going to make your hair look heavy and oily. Use your fingers to make sure you get an even amount of product throughout your hair. Step Three: Use your comb to part your hair to the right. You’re going to want to use the edge of your comb and you’re also going to want to take your time. Don’t rush yourself. You want that part to be straight. Step Four: Brush through your hair with your radial brush to smooth it out and to create a bit of body. Dianna’s look is full and beautiful. Getting the same body really does call for the radial brush. Step Five: Blow the back of your hair under using the technique we talked about earlier. Start with the section of your hair that lies at the nape of your neck. Continue on with different sections of hair in the back until you’ve done them all. Step Six: With the back done, it’s time to move on to the sides. You’re going to once again blow sections of hair on the sides under, the same way you did with the back in step five. The only different this time is that instead of pulling the hair back or down you’re going to pull it forward. This gives the hair a little extra body. Step Seven: Take your medium barrel curling iron and begin curling your hair in the back. All your going to do is wrap your hair around the barrel of the curling iron starting at the tips and wrapping until you reach your roots. Hold the curl for 5 to 10 seconds and then release the curl by unwrapping the hair from the barrel. Step Eight: After you’ve finished curling the back, move on to the sides and the front using the same method you used to curl the back. Make sure you keep the sections you’re curling roughly the same size. It can be tempting to increase the size of the sections as you curl because it can get a bit tiring, but using the same size sections gives you cleaner, more natural looking curls. Step Nine: Put a little bit of your styling wax on your fingertips and pinch the ends of your hair. Step Ten: Apply a very small amount of hairspray to finish up. You only want to use a little. Too much will make your style look crunchy and unnatural. You could also end up with little flakes of spray that look an awful lot like dandruff. There is a lot to love about this gorgeous curly hairstyle from Sofia Milos. It’s easy to do and can work for any occasion, be it a casual night with friends or a more formal event. It’s also great for women of any age although it works best on diamond, oblong, oval or square face shapes. You can get this look in roughly twenty minutes, making it a great go-to look whenever you feel like doing something different. Step One: Wash hair and allow it to dry until it is damp – not completely dry but not still wet. Step Two: Use your fingers to lift your hair. Move the diffuse up the ends of your hair to your scalp using a circular motion. Be careful not to dry the hair completely. You want it to remain a little damp as allowing the hair to dry naturally will give the style a more natural look. You can do what needs to be done while preventing your hair from drying completely by using the lowest setting your dryer has. Step Three: Put a little big of your styling or pomade on the ends of your fingers and then pinch the ends of your hair. This gives the ends a little weight and allows for longer curls without sacrificing bounce and natural movement.